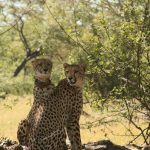 Read the first post in the Kenya Safari series here. 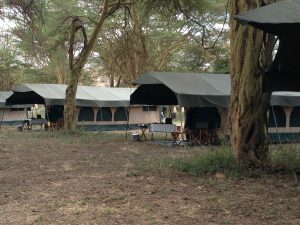 If Giraffe Manor and Mount Kenya Safari club can be labeled as a “soft” safari, then the Abercrombie & Kent mobile tented camp is the exact opposite on the spectrum. This is a real deal safari experience; this is how Hemingway saw Africa. On my recent trip to Kenya, we spent two nights at an A&K mobile tented camp in the Lewa Wildlife Conservatory. The camp offers an experience unlike any other. You’re sleeping in a tent and eating out under the stars, but you also have a tent steward, flushing toilet, and full bar. If you’re not one for the outdoors, it might not be enough to keep you happy and if you’re a rugged outdoorsman it will probably feel like too much. But, if you want a close encounter with the beautiful Kenya landscape and you aren’t looking to sacrifice too much comfort, this will be a perfect fit. 7:00: Meet your fellow travelers in the dining tent for a hot breakfast of eggs, bacon, sausages, and toast. Kenya has some of the best produce in the world, so don’t forget to taste the local pineapple and mangos. 7:30: You are off on your game drive! The A&K vehicles are custom designed Land Cruisers with 6 captains seats and a pop-up roof so everyone has a great view from the window or from up top. The animals you’ll see will depend on your location and season. On my trip in early October we had no problem finding giraffe, zebra, gazelle and warthogs. We also had the great fortune to happen upon 3 of the “big 5” all grazing together: elephants, rhino, and cape buffalo! 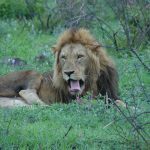 There are only 2 prides of lion at Lewa, so those were hard to spot, but we could tell (by the noisy baboons) that one must have been close to our camp. 1:30: Depending on your luck during the game drive, you may have lunch a little earlier or later but, rest assured, you will be well fed! The camp chef and his crew will undoubtedly lay out a beautiful buffet with selections like chicken satay, roast beef, pasta salad, cucumber salad, quiche, and pizza! Don’t forget to save room for dessert, which is served at every meal! Siesta time: This was my favorite part of the day. Our group would take our time with lunch and spend some time chatting over a glass of wine after. 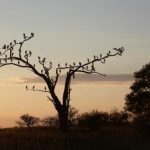 As the group would slowly thin out, we would take some time out for reading, napping, and reviewing all of our favorite photos from the morning drive. This was also my favorite time to shower and wash the morning off. Each tent has a shower room off the back and your steward will fill the shower reservoir with hot water. You had four minutes worth, which was plenty of water if you turned it off while shampooing and lathering up. One word of caution, these shower stalls do not have roofs. And, as I learned the hard way, you never know what the monkeys might drop in from the trees above. 4:00: In the afternoon, you’ll regroup for another game drive. As the sun sets, you’ll have perfect lighting for photography. 6:30: Time for a sundowner! The A&K staff can get very creative with their happy hours. 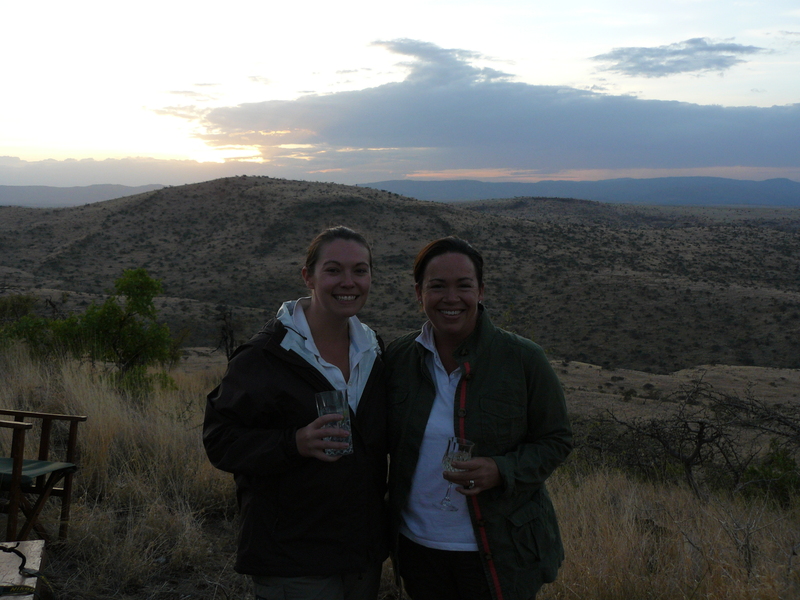 We found ourselves on a beautiful hilltop enjoying gin & tonics and watching a gorgeous sunset. You might also be treated to a special performance by local artists or a romantic sunset picnic. 8:00: After a few cocktails, you’ll drive back to camp for a delicious 3-course meal. Warning: exercise can be hard to find on safari and A&K will make sure that you are well-fed, even in the bush. So, pack some stretchy pants, enjoy yourself, and worry about the gym when you get back home! 9:00: Enjoy an after dinner drink around the bonfire and take a moment to appreciate all of the stars above. But, don’t stay out too late because your morning jambo call will sneak up on you! 10:00: Lala Salama – Good Night! Your tent will be furnished with either a full or King Bed, there will be no cots and sleeping bags on this trip! Your bed will be draped in a mosquito net and, the best treat of the day, will be the hot water bottle under the covers just waiting to lull you into a deep, restful sleep. 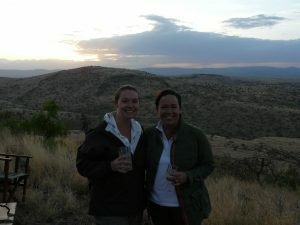 This entry was posted in Africa/Safari and tagged A&K, Adventure Travel, Africa/Safari, Kenya, Lewa. Bookmark the permalink.